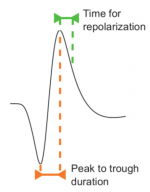 The Waveform Analysis (MATLAB / GNU Octave) toolbox classifies broad vs narrow spiking neurons based on the characteristics of extracellularly recorded action potential (AP) waveforms. This toolbox was developed and is maintained by Salva Ardid PhD.You can download the matlab code here matlab-files (zipped). Ardid S., Vinck M., Kaping D., Marquez S., Everling S., Womelsdorf T. (2015) Mapping of functionally characterized cell classes onto canonical circuit operations in primate prefrontal cortex. Journal of Neuroscience. [pdf link to come soon, for pre-print please email us]. This toolbox is free but copyrighted by Salva Ardid, and distributed under the terms of the GNU General Public Licence as published by the Free Software Foundation (version 3). Should you find the toolbox interesting, please try it in your data. Just ensure that any publication using this code properly cites the original manuscript and links to this repository: – Ardid, Vinck, Kaping, Marquez, Everling, Womelsdorf (2015) Mapping of functionally characterized cell classes onto canonical circuit operations in primate prefrontal cortex. J. Neurosci. In Press. Copyright (C) 2014-2015, Salva Ardid. Unordered List ItemW: averaged AP waveforms (1138×52: number of independent recordings including single and multi-units, times the number of samples of their waveform). Unordered List ItemX: time steps of the samples. Unordered List Itemisolationquality: 0-3 categorical code that describes the likelihood that the avg. waveform corresponds to a single unit. Unordered List ItemisolationqualityInfo: meaning of the corresponding numbers; 1) multiunit, 2) mostly single unit, 3) highly isolated single unit, 0) not specified. Unordered List Itemdatasetname and spikechannel: self-explanatory; identifiers of the datasetname and spikechannel from where the averaged AP waveform was processed. Unordered List Itempar(:,1) contains the peak to trough duration: time interval from the minimum W to its maximum. par(:,2) contains the amplitude of peak before depolarization (currently not used). Ordered List ItemXpca1stcomp: the measure of the AP waveform, PC1 in this case. Ordered List Item’PCA1stComp’: short explanatory label for the measure. Ordered List Item’First component of the PCA’: long explanatory label for the measure. Ordered List ItemXlim: range of the measure distribution. Ordered List Itemmu: estimate of the mean of each component in the 2-Gaussian fit. Ordered List Itemsigma: estimate of the covariance matrix of each component in the 2-Gaussian fit. Ordered List Itempcomponents: estimate of the mixing proportions of each component in the 2-Gaussian fit. Ordered List ItemFIGSDIR: refers to the subfolder where to save the resulting plots. Ordered List ItemCalibrated Hartigans’ dip test: [dipPCA,pdipPCA,xlPCA,xuPCA]. pdipPCA < 0.05 discards unimodality. Ordered List ItemClassification of cells into three groups: narrow (ind_narPCA), broad (ind_broPCA) and unclassified or in-between neurons (ind_fuzPCA) according to a 2-Gaussian model. According to that model, unclassified neurons are those for which the likelihood to be considered narrow is not larger than 10 times the likelihood to be broad, and vice versa. Ordered List ItemAkaike’s and Bayesian information criteria for the 1-Gaussian vs 2-Gaussian models: [aicPCA_1,aicPCA_2,bicPCA_1,bicPCA_2]. Within a criterion, the lowest value is considered best. The code of the waveform analysis calls plot2svg to save plots as svg files, which is available here:http://www.mathworks.com/matlabcentral/fileexchange/7401-scalable-vector-graphics–svg–export-of-figures.